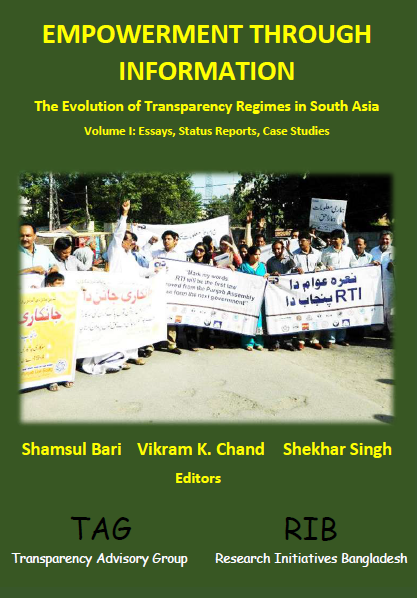 In order to objectively assess the use of the RTI law and its functioning, SNS in collaboration with other civil society groups has been undertaking peoples’ assessments of the implementation of the RTI Act. Click on the title below to access the assessment report. In addition, findings related to the type of information being sought by appellants and complainants in terms of whether such information should have been proactively disclosed and a gender break-up of information seekers is also presented in the report. Read the report. 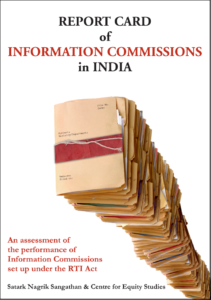 This report analyses the performance of information commissions in India in terms of the number of appeals and complaints registered and disposed by the ICs, the number of pending appeals and complaints, the estimated waiting time for the disposal of an appeal, availability of annual reports of ICs, frequency of violations penalised by ICs and transparency in the functioning of ICs. 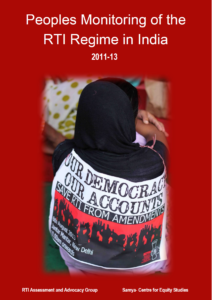 The report by SNS & CES, covers all 29 Information Commissions in India which have been set up under the RTI Act, 2005. 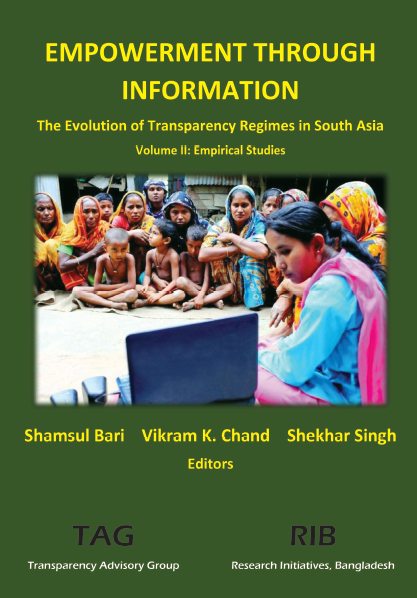 This report focuses on the independent adjudicators of the RTI Act- the information commissions, the high courts, and the Supreme Court of India. 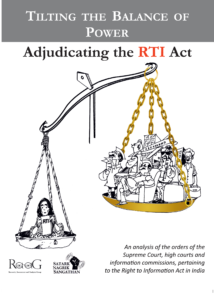 The report provides a detailed analysis of the orders of these adjudicators pertaining to the RTI Act. 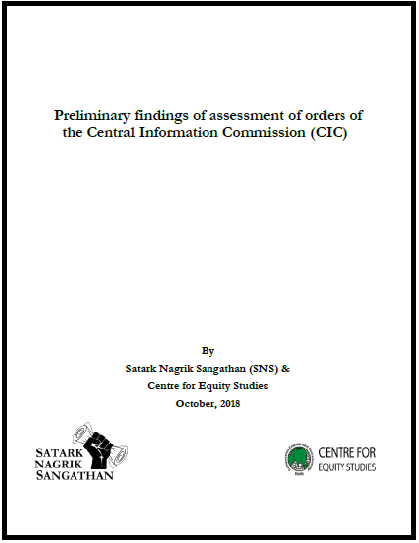 The assessment by SNS & RaaG (Research, Assessment & Advocacy Group) covers a sample of 2,000 orders of the Central Information Commission and the State Information Commissions of Rajasthan, Bihar and Assam, all the High Courts and all the orders of the Supreme Court related to the RTI Act. Read a brochure on the report. 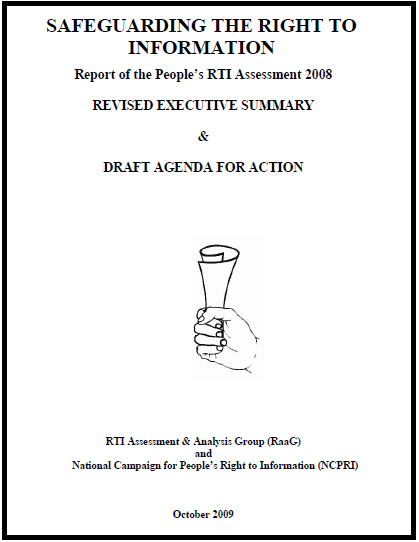 Satark Nagrik Sanagathan was involved in a national assessment of the implementation of the RTI Act in India carried out by the Right to Information Assessment & Advocacy Group (RaaG) and the Centre for Equity Studies (CES) in collaboration with civil society groups across the country, including the National Campaign for People’s Right to Information (NCPRI). The national study covered the central government, five state governments, nearly hundred public authorities and information commissions across the country.